"The birth was amazing! Thank you. Really feel that the class prepared us and made our experience so much better. " "Thank you SO MUCH for all the knowledge we got (in the class). It was incredibly helpful as we had to make some tough decisions and the information we got from you helped us do it and be comfortable with what we chose." "We really enjoyed class and my husband is excited about how much he learned. We can't wait for next week. " "Class atmosphere was fun and relaxed. I loved it." 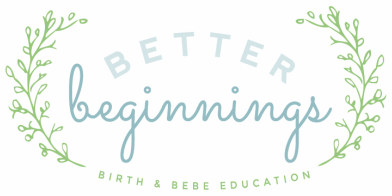 "I am SO glad I found Better Beginnings! I am a believe in what Bianca & Kate do! love them!!!" "You did a fantastic job working with the laboring mother. If all women had the support that you provide, it would be a totally different experience." "Bianca, you single handedly steered the course of events from the routine assembly line mentality, to a loving and compassionate rally behind Talyn. Your knowledge and passion made an immeasurable impact on one of the most memorable events in my life. I know for a fact the medical staff/doctors were forced to acknowledge that we had a heavy weight in our corner. Thank you for helping my family in such a profound way.